So exciting that my doll “Sophia” was selected as the Curator’s Choice doll! That means she will be traveling for one year with the entire Hoffman Fabric Collection. I also get a prize of fabric! Love the Hoffman Fabrics, last year’s prize fabrics were gorgeous so I am looking for to this year’s prize. My goal of completing my Christmas ornaments by August first is a little behind. I have most of the ornaments started but not completed. The thought of taking them out side to sand before I paint them is the biggest obstacle. It has been so hot, and today we had unsettled weather, very tropical, wind, rain and humid, ugh, sitting out on the porch and sanding just was not very enticing. Sanding is not my favorite thing to do either. However, I will try and get some done tomorrow. I have been working on a commission piece for Christmas, and it is nearly completed, and tomorrow should be done. 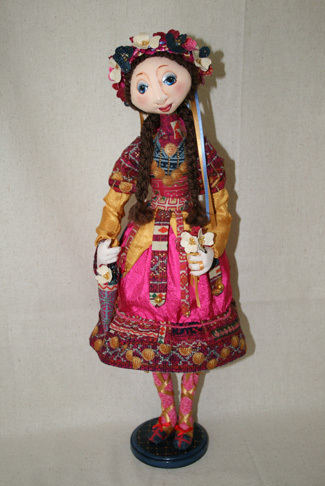 This entry was posted in Art Dolls, News and tagged art doll, Art Dolls, Cloth Doll by Debra Maerz. Bookmark the permalink. Congratulations ( looks like you have many accomplishments! ) I love your doll, you are a fabulous artist!